What makes a number weird, and why, as far as anyone can tell, aren’t weird numbers odd? What do monsters, moonshine, and 24-dimensional oranges have in common? Why couldn’t Sam Loyd get a patent for his famous fifteen puzzle? What is the significance of the statement “the smallest number not nameable in under ten words”? Can one infinity be larger than another? If you are fascinated by the weird, the odd, the curious, and the just plain puzzling, it’s no wonder that you’re drawn to mathematics. 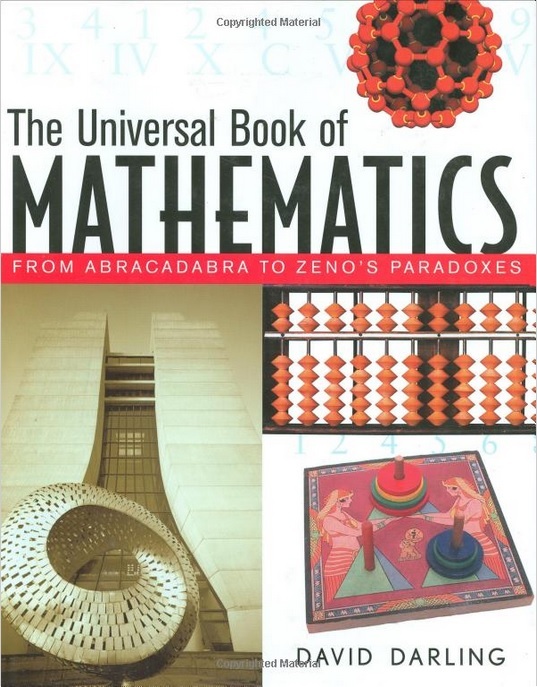 And, if you can’t resist the urge to indulge these fascinations–and discover plenty of new ones while you’re at it–welcome to The Universal Book of Mathematics. This unique, one-stop, A-to-Z resource is packed with more than 1,800 entries that cover everything from nuts-and-bolts math to the most arcane unsolved theorems, from profiles of notable mathematicians to intriguing puzzles, challenging games, and even math humor. The noted astronomer and celebrated author David Darling has always been inspired by the impact of mathematics on the imagination. He has, therefore, taken this opportunity to expound on every significant number, shape, ratio, dimension, theorem, conjecture, set, and paradox in the mathematical universe. And he provides more in-depth information than the entire current crop of math dictionaries combined! You’ll find stimulating discussions on the search for a fourth dimension and its impact on such authors as H. G. Wells and Edwin Abbott; the reality of imaginary numbers; parallel universes; and patterns in the heart of chaos. You’ll also discover the number that infects the whole of mathematics and places fundamental limits on what we can know; the “cloud” that surrounds every real number; and how to marry a sultan’s daughter.